The Three way version of the Ellams are playing for few weeks now. I haven't finished them yet; painting and putting the veneer on is a hard step to make. It would mean no sound from these wonderful speakers for at least a week. I don't have many experiences with other diy speakers. I heard a few last year on a diy meeting. I can tell from my memory: this is another level! I am really impressed by the sound. The 8" driver gives the sound a full body without any boom or unpleasant woollyness. The mid- and high-section is unbelievable clear, compared with the two way version the dynamics are balanced and everything feels perfect placed in the spectrum. My signal is generated by a NOS DAC (4 parallel PCM1794 chips per channel) and still amplified by the LM3875's. 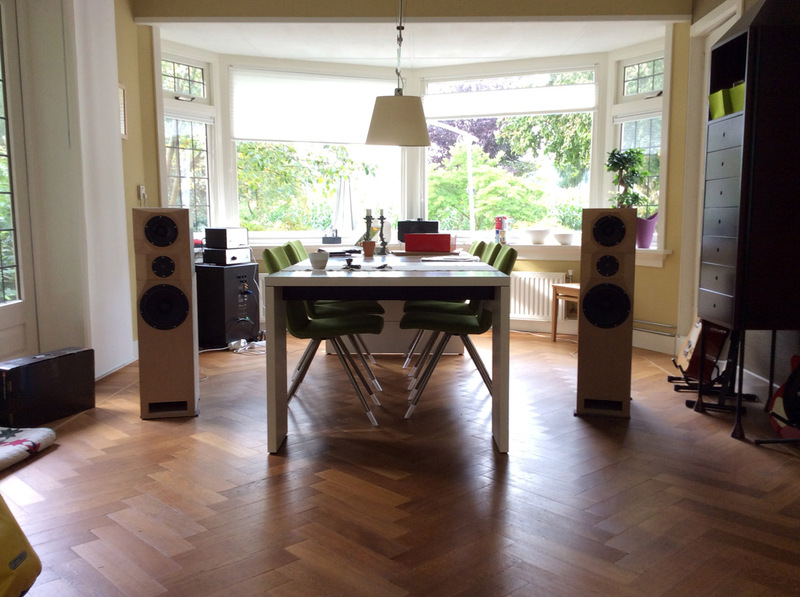 The 40-50 watts are enough to power the speakers to unpleasant levels in a 60+ square meter living room. I still use a subwoofer. With the 2-way i needed to place the crossover-point around 80Hz, it gave the sound body but the extreme low (20-40Hz) was muffled. With the 3-way she rolls off at 22Hz. Now i know why the (bigger) Rell subwoofers are called 'musical'. Drum kicks and bass licks get unbelievable live like. Classical pieces are experienced as in the concert hall it's record in. Don't get me wrong, this isn't to praise my subwoofer. Its all thanks to the Ellams, every thing above the 35Hz comes from the 8" drivers without any reinforcement.